A few months after I wrote my blog about Key Words and the value of using these in context as opposed to focussing on the elements of music as distinct entities, I started to work on a new Musical Futures approach for primary teachers and students which eventually became known as Just Play. At the time, my role was as Head of Development for Musical Futures in the U.K. and my remit was to work in partnership with Musical Futures Australia to develop an approach to support generalist primary teachers to deliver whole class music making with their classes. 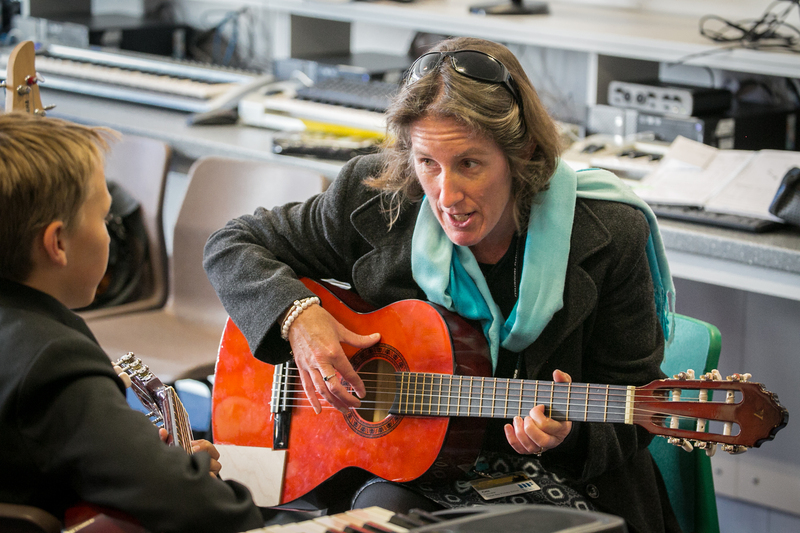 The resulting training and resource offer has since been adopted as one of the key Musical Futures approaches and is currently being delivered to over 2000 teachers across Australia as well as in Asia, UAE, New Zealand, Europe and the U.K.
During the 13 years of my association with Musical Futures in a number of roles, most recently as a consultant for Musical Futures International, I have been fortunate to work with incredible people and to have learned so much from others that has informed my thinking, my practice and to learn what has driven me as an educator and a musician. As my time on the core team at Musical Futures in the UK came to an end, it was a great opportunity to reflect, to remember key events or moments that became significant in the journey. So I start with some of those. I remember spending time in my classroom at Monks Walk with Lucy Green, looking aghast when she explained that to be part of the MF pathfinder pilot I would be allowing year 9 to make choices over repertoire, planning, musical needs and defining their own pathways through tasks. It terrified me, I was the teacher, how could the students possibly be able to achieve anything if they were given too much freedom? I knew only one approach to music teaching-the one I had experienced for myself outside the classroom as a classically trained clarinet player, dependent on notation and very under confident with leading or delivering practical workshops as a music leader. Lucy’s book “Music, Informal Learning and the School: A New Classroom Pedagogy” (click for details) is a fantastic summary of that work that was just the start of 10 years of trying to get it ‘right’ in my classroom! Lucy completely understood the classroom context and how teachers needed to adapt to make sure the pilot was a success. We enjoyed unpicking what we had seen the students achieve in the lessons and recently spent some time over Skype discussing the difference between haphazard and holistic learning and how one student from that very first pilot class made it onto the X Factor. This came as no surprise given that through MF he was able to express himself very successfully through singing and performing! I have had endless edu-banter with David Price over so many issues, from the value of social media in the education community to the challenges of increasingly target-driven changes in our schools. Most recently we spent some time over breakfast on a glorious Australian summer day discussing the current edu-twitter debates over teacher led learning and direct instruction vs PBL and student centred approaches, a conversation that I look forward to continuing in the future. I have worked with driven, creative and passionate people like Abigail D’Amore, who brought real balance and clarity to some of the big and hugely ambitious ideas we had for driving Musical Futures forward and who played such an important role in grounding MF in its pedagogical roots. Abi was also central to building the organisation as it now stands, independent in its own right having successfully transitioned from a fully funded project to an organisation now looking to a new future in the capable hands of Managing Director Fran Hannan. Most recently I have loved co-developing the MF Just Play resources and training programmes with Ian Harvey and Ken Owen at Musical Futures Australia. It has been so valuable to look at the whole of MF through fresh eyes with them and with their teachers. We have worked together to refine and plan and deliver new ideas and approaches and it has shown me that Musical Futures truly does have relevance anywhere that there are teachers looking for new ways to engage their students with music. Kids are kids, teachers are teachers and music is music. Let’s find a fit for everyone regardless of context. They also taught me that it’s OK for training days and classroom music to be fun, that fun doesn’t make the intention any less rigorous or meaningful, just a far more enjoyable experience for everyone! But of course along the way I have met and worked with so many teachers in schools and dedicated folk in the UK Music Ed sector that I think sharing part of my MF story as I will do below is by far the best way to thank everyone for the support and friendship I have found across my time with MF. Musical Futures has been a massive personal journey for me, first as a practitioner having to completely redesign my identity as a musician and a teacher, then as I travelled and visited schools and worked with teachers to really try to understand what Musical Futures is when it is translated into practice at the chalk face. I have also been trying to understand how and why it impacts on the lives of thousands of students and teachers across the world and how it can continue to change and adapt to the needs of those who are looking for ways to keep music relevant and meaningful for students in schools. When I left Monks Walk in the summer of 2015, in my leaving speech, my line manager asked staff whether they had any idea of Musical Futures actually is. Fun, Challenging, Inspirational, Groundbreaking, Inclusive, Excitement, New Experiences, International. I was so happy that over the years of observations, discussion, disagreement, negotiation, banter, partnership, collaboration and so much more that this was the impression he had formed of it. It was a lovely way to leave. Musical Futures can be all those things. But how do you know when you walk into a class that it’s Musical Futures in inspiration or design? Is there a definition, a description or something that remains consistent no matter how and where it’s applied? I’ve been visiting MF schools over the past 7 years or so, but back in October 2015 I led a tour of MF Champion schools accompanied by a group of teachers from Australia, New Zealand and Canada that really gave me the opportunity to reflect on this. What I found is that Musical Futures doesn’t look or sound the same in any of the schools I’ve seen. It feels like Musical Futures, I know Musical Futures is there, but I have struggled to pin down how that actually translates into practice. Our visitors also seemed to find it hard to define what made the lessons, departments and teachers ‘Musical Futures’ lessons, departments and teachers. Other than that they and I had said they were and that they use the MF approaches and resources in much of what they do, my question remained. What does ‘an approach’ actually look like when it’s applied in practice? I saw things that I thought worked really well and things I was less sure were effective. This was down to the interpretation, personalisation and moulding of the approach rather than the approach itself. To find the answers to the million questions I had, I started by trying to identify what everything I saw in the schools and lessons had in common and I had some great discussions with the others in the group as we drove from school to school. The first very impressive observation was the engagement, concentration and focus of the students we saw. More than that though, when we talked to them it became clear that they really care about their music work and the department, their teachers and the value of music in their schools. Perhaps they feel some ownership over this (MF asks that learning starts from students’ own musical passions and interests) and so it becomes particularly important to them. But can we or should we accredit this solely to MF? Perhaps MF helps or allows teachers to think about what they teach, why and how and the result is that compelling engagement I have seen everywhere I’ve visited. I needed to unpick this some more. Find Your Voice vocal work that has inspired a choir of over 60 students, boys, girls and staff at Fred Longworth. 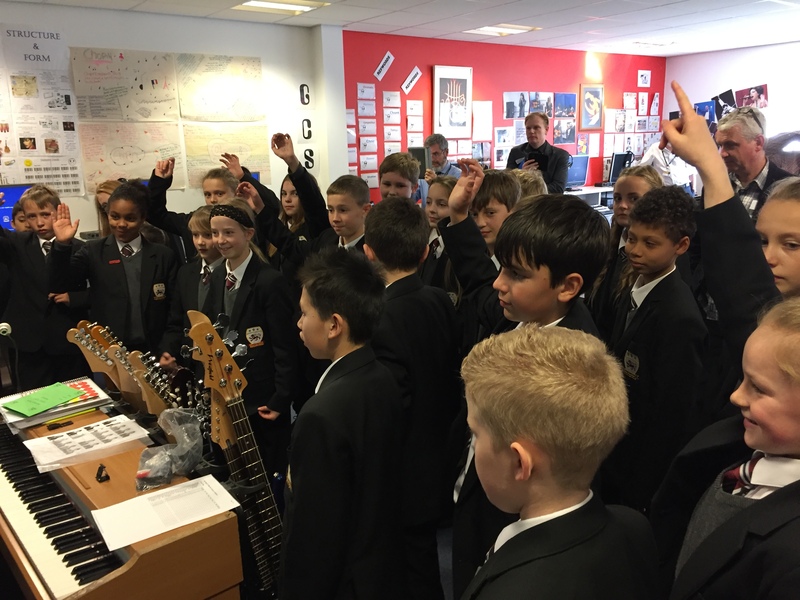 At Benton Park it was a class of year 7 singing and playing enthusiastically and musically together while we joined in for a mass jam of Rocking all over the world. It was the On Cue project at Morpeth where 80 students from 3 schools came together with facilitator Adam Sanders and created a piece from scratch which they then performed at The Music Learning Revolution at the end of the week. It was the year 8 at Wymondham Academy turning round to the group next to them and asking to hear what they had done as the rest of the class worked on in their groups. At Flegg it was a lunchtime club that looked and sounded so like a MF lesson as students went off into groups to copy and play songs they had chosen that we couldn’t tell when lunchtime finished and lessons started. At Willingdon it was the year 8 boy telling me that since their new (MF Associate) teacher had started at the school, everything had changed. He could play bass now but he never thought he would be able to play anything. And throughout the tour itself, we sang on the bus, we played music together and the moment that moved me most of all was in a pub where the teachers got up and played one at a time and together. I thought how unbelievably lucky their students are to have musicians of such quality teaching them. This reduced me to tears as they played truly from the heart and I realised that I was on a bit of a journey of my own, transitioning from being in the classroom at the heart of making music with my students to opening this world to so many more young people and their teachers through my new role with Musical Futures. Can Musical Futures take credit for any this? Music lessons where the majority of time is spent making music? That “you just feel it” moment in the workshop at MLR where we sang and played and bonded through music? And what about the tour itself? 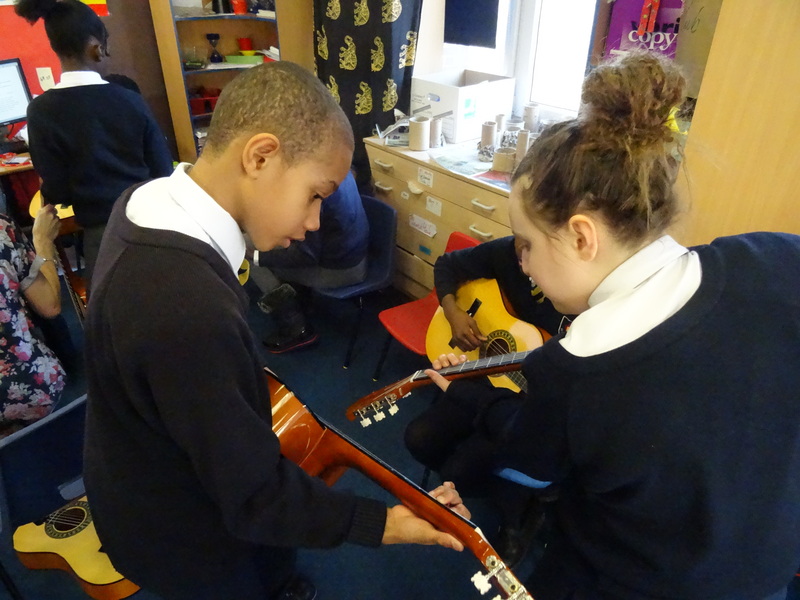 Bringing people together through music, forming friendships through a shared drive to find new and best practice to take back into classrooms underpinned by shared Musical Futures aims? I decided to ask someone I thought might have an answer for me. Jonathan is an ex student of mine. A classically trained pianist and self-taught guitarist, he came through my school at a time where MF was slowly embedding into the department and music is his passion. In the 6th form he came into lessons with younger students and helped them musically. He was also a Music Leader at a local primary school, supporting the teacher with music lessons with much younger children. They loved him. in his school. That’s absolutely what it was for me at Monks Walk. It took me to that parallel solar system that my line manager described and helped me start to make sense of it through evaluating my own musicianship and approach to being a teacher, my beliefs and values as a musician and an educator. 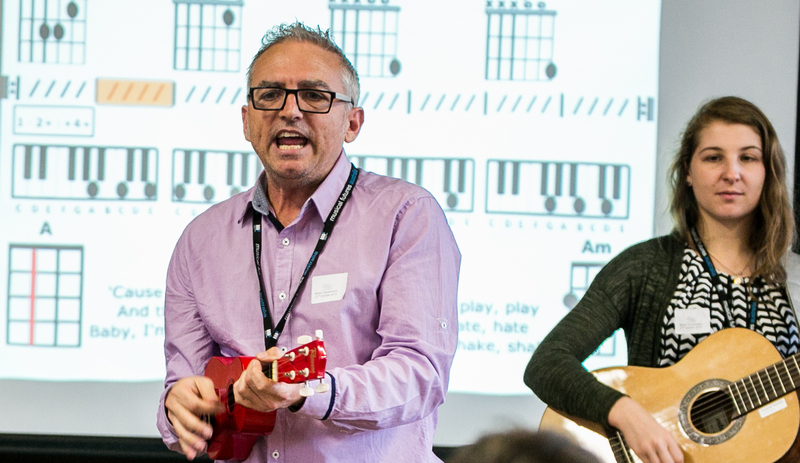 Musical Futures is more than an approach and it’s not just a downloadable resource. It’s not a 6 week ‘MF inspired’ project or a rock and pop scheme of work for year 9. The Just Play workshops that have been running in the last 2 years in the UK, Australia and Asia are filled with people who tell us they had been inspired by a great musical experience in the workshops to go back into their classrooms and make something happen. So to everyone who went on part of this journey with me, thank you. 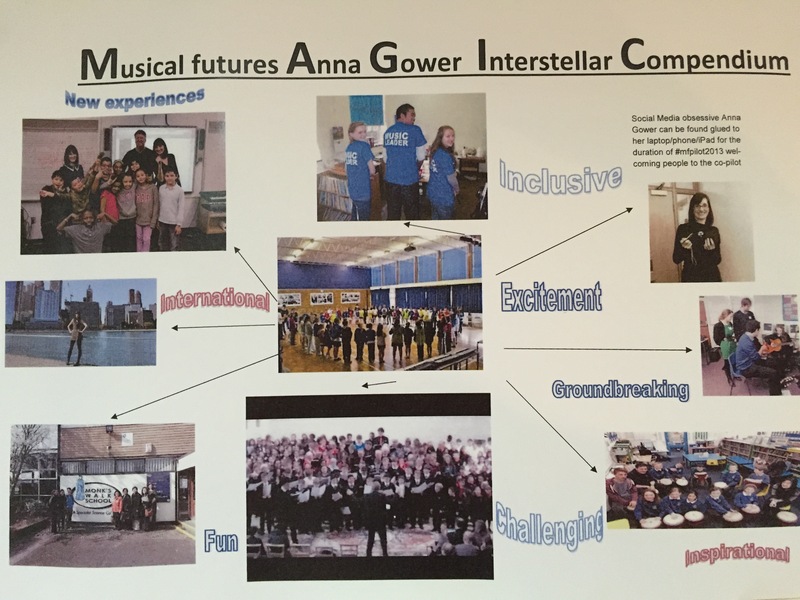 I’m sharing just a few of the photos that sum up for me what Musical Futures is all about. Musical Futures really is all those things my line manager says it is. But most of all it is the most inspirational and exciting personal journey that really can change everything. Music really is everywhere. Today as I stepped out of Haggerston station on my way to visit a school, I could hear piano music. It turned out that the mobile coffee stall right outside plays classical music as staff serve commuters and the music echoes through the station. Later as I had coffee with a friend visiting from America we were talking about the American Band model and how the university where he works has a band of over 150 students. Many of them ‘take band’ in school, they continue at university and so a tradition is established and the fact that the band plays at all the sports fixtures means it’s firmly embedded in the culture of the establishment. As we talked, loud music was playing in the cafe, this time contemporary urban music setting the tone for a central London coffee bar. As we looked out of the window we observed how many people walking past were wearing headphones. Train carriages full of commuters are pretty quiet these days as we lose ourselves in our own world of personalised sound that’s delivered straight to our ears via our headphones. Talking last week to a 6th form student about how he uses digital platforms to support his music making, he said that he often uses the recommendations that pop up on Spotify, You Tube or Sound Cloud and he follows these through to discover more and more new sounds. Music really is everywhere and it’s more accessible than ever. But there’s one place where you don’t hear a lot of music. I am talking generally here and my focus is on secondary schools so apologies to schools that do play music in corridors or embed it into school life. And judging by how often my primary-aged children come home singing, I know they are making music at various point across the week. But my experience of secondary schools has been very different. It’s common in most schools for headphones to be banned, students are very creative at hiding them but there’s often a tell-tale white lead tucked under their collar or hanging from their sleeve as they use music to challenge school rules. In secondary schools, it’s rare to hear music played in assembly or in the corridors or canteen at break time unless somebody happens to be practicing in a public space. But mostly this is confined to the music department where it seems the sole responsibility for the music education of our students lies. Wouldn’t it be amazing if, just like in real life, schools were open to music coming out of the music department and spreading across the school? if just like literacy, numeracy and more, cultural and arts education became the responsibility of everyone. Could we bring music into lessons and assemblies, building on the strong tradition of primary school music assemblies, singing assemblies and more? If primary teachers are expected to be able to deliver some form of music learning despite limited training and support, is there any reason why secondary teachers can’t do the same? Break time busking, music in the canteen, samba bands or taiko drummers at sports fixtures-music could really bring a school to life! But that’s not what the #mufuchat question is asking. What is the place of classical music in the classroom? Is classical music the main genre through which music should be taught? Our exams system certainly seems to support this view. Taking GCSE and A Level music is a heck of a lot easier if you’ve had a private instrumental lesson or two! And westernising other musics in order to mark understanding of them (can you hear dynamics in this piece of gamelan music anyone?) is another thing that I’m not sure we have got right yet. So when I think about the debate about which music should be taught in schools and how, I keep coming back to the same questions, which as usual I don’t have all the answers to! Is it really possible to replicate the experience of a one to one instrumental lesson where you can learn repertoire, theory, technique and relevant notations with 30 students and a few keyboards or computers? Where is the classroom pedagogy for teaching music and are different pedagogies, approaches and teachers needed for music of different genres? Who decides on the content, the approach and how do we know it’s any good? How important is authenticity? I remember playing Pachelbel’s Canon to a class as they came in and heard an excited voice ask “Woah Miss are we going to play violins?” Well I didn’t have any violins and if I had I didn’t have the knowledge or skills to teach 30 year 8s how to play that piece on them in a classroom setting. We explored it vocally and with ipads. We unpicked how the melodies were constructed and knitted together, but it didn’t feel very authentic to me. I felt that their experience of the music had been a bit one-dimensional and I felt really guilty when I saw that child’s face fall when I said we wouldn’t be playing violins (but if his parents wanted to pay, he could have some lessons). What about progression? My daughter did a year of First Access brass in year 5. At the end she could get a few notes from a trombone and performed with the class at an assembly. But she didn’t know how to hold it properly and without some serious work she wouldn’t have progressed much further because she simply didn’t have the technique to produce more sounds. 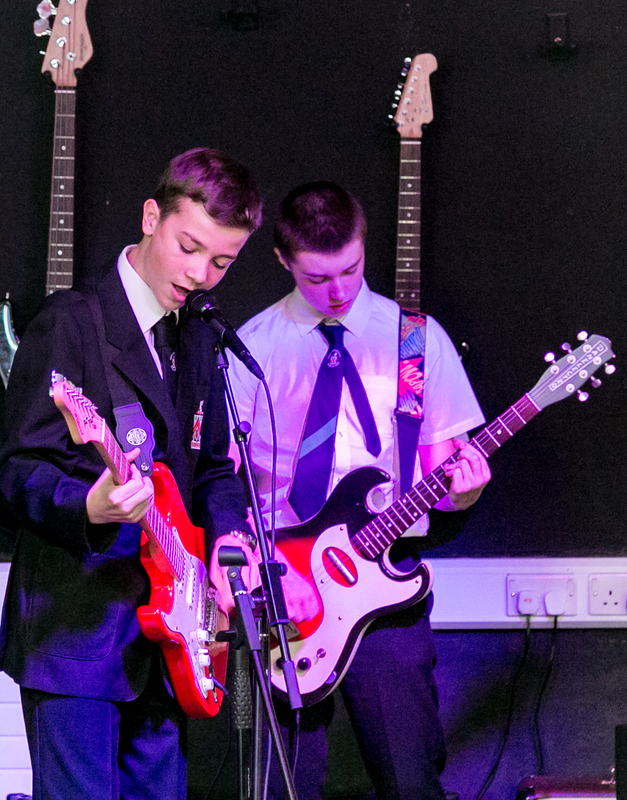 if I’m being honest, the performance at the end of the year wasn’t great and I reckon that time and money could have been spent a bit more sustainably elsewhere, perhaps on training for classroom teachers on how to link music to topic work or on some instruments that the children were likely to find in their secondary school. What about the reality? I’m talking secondary here. One hour each week, if we are lucky for three years. What is a realistic expectation, bearing in mind the diversity of experiences year 7 will have had in primary school before they get to secondary school? Can we ever expect to replicate those years of one to one instrumental lessons in these circumstances? Is theory, notation, instrumental skills to a level required to take A level music ever really attainable just in the classroom? So I keep coming back to this blog that I wrote last year about breadth vs depth. And does classical music belong in the classroom? Of course it does. But not just in the music classroom. And I don’t feel it’s the responsibility of music teachers to bring on the next generation of classical musicians or listeners. I think music teachers need to open minds, facilitate the necessary skills and understanding to appreciate that music is music, you’ll like some, you won’t like others and that’s OK. How they choose to do this is up to them and if they are successful then pretty soon music will spill out of the music department and wash through the whole school and who knows what might happen next? Maybe some of those commuters with their headphones on are listening to Bach. 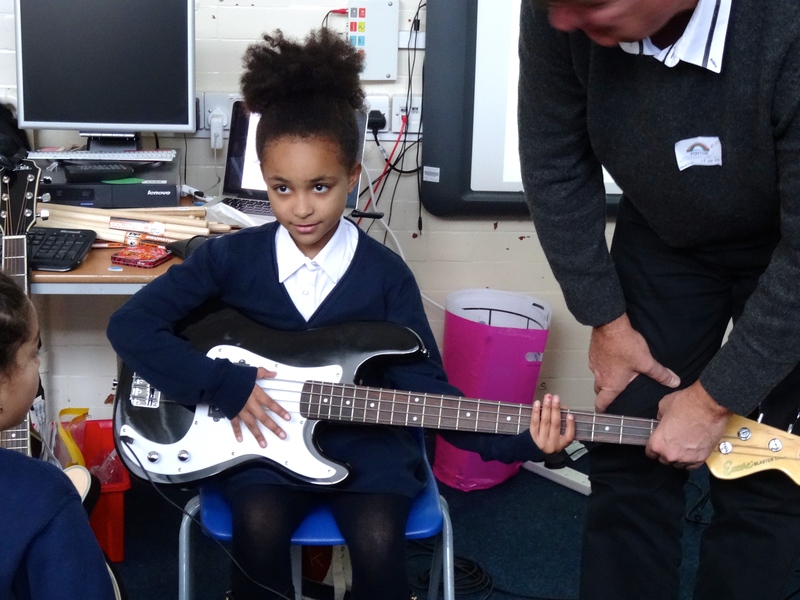 Musical Futures: Just play is such an interesting project to be involved in. I have met some really inspiring primary teachers here and overseas who may not have much musical experience or instrumental skills but who recognise the value of making music with their classes. 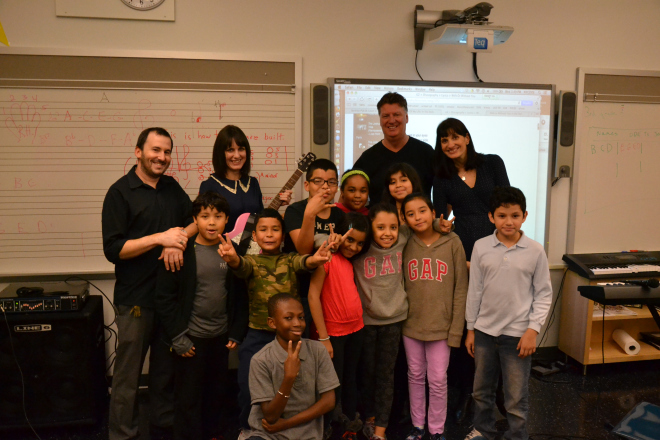 Back in October 2014, Abi and Anna from MF UK and Ken from MF Australia visited New York to have a look at the work of Little Kids Rock, a non-profit organisation committed to opening up musical opportunities for primary aged children in schools through their Modern Band Programme. Following the visit, we looked at the overlaps between our approaches and in particular how running an intensive musical training workshop for teachers could help primary generalists to feel confident and competent to start to use Just Play with their classes. 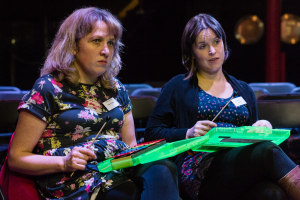 As Musical Futures launches their “Just Play” pilots designed to be led by generalist primary music teachers (no musical experience required!) in Australia and Scotland in the next 2 weeks, I’m revisiting a debate that always raises controversy and rightly so! And do you have to be musical to teach music. Is there a difference? I want to try and clarify my stance on this by looking at some of the things I have taught and seen others teach over the years and in particular how it has been taught. On my last day at Monks Walk we held a big event for 100 children from feeder primary schools. As part of this, they watched a concert in the afternoon and then sang with our choirs and orchestra to finish the day. It was the perfect end to 11 years and I will remember it as one of my favourite days there. But the absolute highlight was that some of my year 9 class performed work they had created in class as part of the concert. I first blogged this on the Peer to Peer network and the comments at the bottom show it’s a hot topic for debate. The search for answers to some of these issues and in particular how using Musical Futures approaches can have an impact will underpin one of the first tasks in my new role as I visit Musical Futures teachers across the UK, spend some time in lessons, discover how they have integrated and adapted MF into their teaching and departments. I know I will learn a lot.